Missile Launchers and Related Equipment Catalog, Ordnance Pamphlet 1855, 1953, is a Navy catalog of missile launchers, rocket launchers, depth charge projectors, and related equipment. Please report any problems with the Mail Feedback Form for correction. 1. Ordnance Pamphlet 1855 summarizes basic information on types of missile launchers, rocket launchers, and projectors, and equipment related to these classes of weapons. 2. 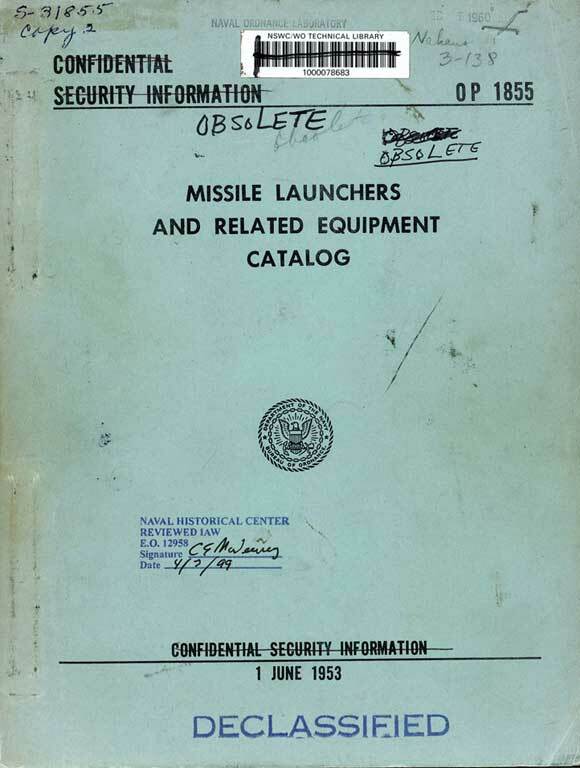 The material presented in this publication brings under one cover readily available reference information on many weapons. It can be used for comparisons of weight, size, ammunition used, limitations, and general effectiveness. 3. This publication supersedes Ordnance Pamphlet 1304 (Preliminary) dated 14 August 1945, and Ordnance Pamphlet 1304, Change 1, (Preliminary) dated 28 June 1946, which should be destroyed. 4. This publication is CONFIDENTIAL and shall be safeguarded in accordance with the security provisions of U.S. Navy Regulation. It is forbidden to make extracts from or to copy this classified document without the specific approval of the Chief of Naval Operations or originator, as applicable, except as provided for in article 9-10 of the United States Navy Security Manual for Classified Matter.